Meso Chicago by Terry Guen Design Associates is now on display at the Chicago Architecture Foundation. TGDA was one of the 50 design firms invited by the CAF to participate in the 2017 Chicago Architecture Biennial Exhibition- Between States. The design firms were asked to submit 50 transformative solutions that address everyday needs and improve the quality of life for our city’s residents in each of Chicago’s 50 wards. TGDA was honored to have been invited to participate and selected Ward 22. The Little Village and South Lawndale Neighborhoods are located in Ward 22 along the South Branch of the Chicago River. This area of Chicago has the least amount of green space per resident within the City (source: Little Village Quality-Of-Life Plan). Being familiar with the needs of this community from our previous experience working on “The Paseo” project, we determined this was the right site for us to demonstrate how landscape architecture can have a positive impact on a community’s livelihood. Our proposal focuses on the remediation and redevelopment of the former Crawford Coal Generating Station, transitioning this poisonous environment into a healthy community asset. Working in collaboration with local community member’s Georgina Valverde, Artist/ Language Consultant and Amanda Cortes, Assistant to Alderman R. Munoz, our team made special effort to ensure the voice of the community that we were designing for was present in our project. TGDA has collaborated with artist and language consultant, Georgina Valverde, on three different projects representing Chicago's Mexican American and Latin American communities. In all these projects, language has been central to creating a democratic space and inviting the diverse perspectives of community stakeholders. Rather than isolating the languages through translation, we decided to draw on new developments in the theory of language acquisition. Translanguaging recognizes the natural process through which language learners draw on all their linguistic and cultural resources and affirms the dynamic role of multilingual speakers in shaping new forms of thought and culture (García, O. and Li Wei. 2014). This approach to our narrative can be found below but was edited out of our boards on display at the CAF due to submission requirements. Los barrios de Little Village and South Lawndale are located in Ward 22 along el South Branch del Río Chicago, un área ranked second for the least amount of espacio verde por persona within the city. Meso Chicago ofrece un nuevo point of connection between el río, los surrounding barrios de Chicago and la región. 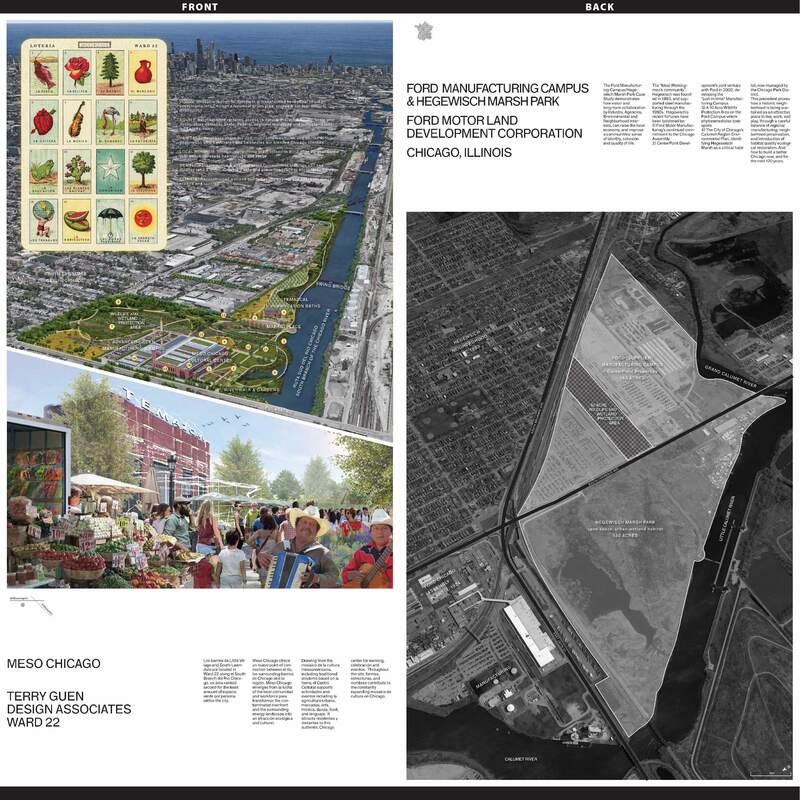 Meso Chicago emerges from la lucha of the local comunidad and workforce para transformar the contaminated riverfront and the surrounding energy landscape into an atracción ecológica and cultural. Drawing from the mosaico de la cultura mesoamericana, including traditional wisdoms based on la tierra, el Centro Cultural supports actividades and eventos including la agricultura urbana, mercados, arts, música, danza, food, and lenguaje. It attracts residentes y visitantes to this authentic Chicago center for learning, celebración and eventos. Throughout the site, formas, estructuras, and nombres contribute to the constantly expanding mosaico de cultura en Chicago. A hi-resolution copy of the Meso Chicago boards on display at the CAF can be viewed online here. LOCATION: CAF Atrium Gallery, 224 S. Michigan Ave.